Del Webb at Rancho Del Lago offers new construction single-family homes in a fantastic Tucson location. Arizona may have a long history of success with active adult communities, but there are also plenty of new construction homes in the Grand Canyon State. By choosing new construction, homebuyers can select their favorite layouts, finishes and optional upgrades. Here are eight Arizona communities which offer new homes in a variety of styles and sizes. 1. CantaMia - Goodyear, AZ Set within the larger Estrella community, CantaMia provides resort-style living for active adults aged 55 or better. The community was opened by AV Homes in 2010 with plans for 1,700 homes in both attached and single-family designs. Residents have access to the spacious CantaMia clubhouse, as well as the 18-hole golf course and other amenities throughout Estrella. 2. Del Webb at Rancho Del Lago - Vail, AZ Opened in 2008, by K. Hovnanian, Del Webb at Rancho Del Lago has a prime location just 20 miles from Tucson. 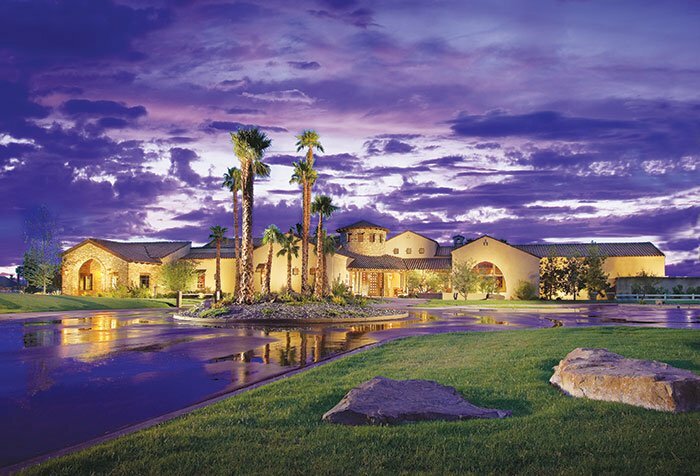 The community was acquired by Del Webb in 2009 with plans to offer a mix of K. Hovnanian and Del Webb home designs. Upon completion, the community will include just 522 homes, yet it also offers a 14,000 square-foot clubhouse and the 18-hole Rancho Del Lago Golf Course. 3. SaddleBrooke Ranch - Oracle, AZ Set beside the Santa Catalina Mountains, SaddleBrooke Ranch was opened in 2008 by Robson Communities. The 5,800-home development includes a 37,000 square-foot clubhouse and an 18-hole championship golf course, as well as an exciting line-up of amenities and activities. Single-family homes are available in wide range of styles with sizes from 1,486 to over 2,800 square feet. 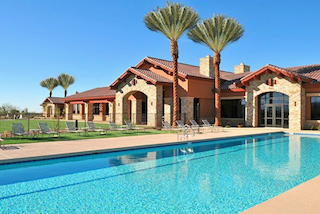 Robson Ranch is a fabulous active adult community open to residents as young as age 40. 4. Robson Ranch - Eloy, AZ Robson Ranch was opened in 2005, by Robson Communities, with plans for approximately 4,600 homes. Highlights of this resort-style development include a 17,000 square-foot clubhouse, an 18-hole golf course, a state-of-the-art fitness center, indoor and outdoor swimming pools, and a variety of sports courts. The community also enjoys a fabulous setting halfway between Phoenix and Tucson. 5. Sun City Anthem at Merrill Ranch - Florence, AZ Opened by Del Webb in 2006, Sun City Anthem at Merrill Ranch is an age-restricted enclave within the larger Merrill Ranch master-planned community. A tranquil setting, 60 miles from Phoenix, makes this development an ideal place for a quiet retirement filled with resort-style amenities. Upon completion, Sun City Anthem will include approximately 4,200 single-family homes. 6. Sun City Festival - Buckeye, AZ Del Webb's Sun City Festival enjoys a scenic setting at the foot of the beautiful White Tank Mountains. The community was opened in 2006 with plans for approximately 7,200 single-family homes in sizes ranging from 1,099 to 2,849 square feet. Highlights include a 31,000 square-foot clubhouse, a 9,000 square-foot wood shop and craft studio, and the 18-hole Copper Canyon Golf Course. 7. Trilogy at Vistancia - Peoria, AZ In 2004, Shea Homes opened Trilogy at Vistancia as a luxurious enclave within the Vistancia master-planned community. Homebuyers can choose from a wide variety of single-family homes in sizes from 1,218 to over 3,000 square feet. The community offers many resort-style amenities, including a 35,000 square-foot clubhouse, an 18-hole golf course, indoor and outdoor swimming pools, on-site restaurants and a full-service spa. 8. Trilogy at Encanterra - San Tan Valley, AZ Shea Home's Trilogy at Encanterra is set 45 miles from Phoenix in a scenic location that is within easy access of urban amenities. Its fabulous amenities include a 60,000 square-foot clubhouse, a private 18-hole golf course, indoor and outdoor swimming pools, and a state-of-the-art fitness center. Upon completion, the community will include approximately 2,400 single-family homes in a diverse mix of styles and sizes.